Multiple file names should be separated by a ‘,’. Extra whitespace after and before a ‘,’ are automatically ignored. Relative paths to files are automatically prefixed by the /css or /js. These settings can be customized by editing values of the variables $css_folder and $js_folder in the plugin file. Absolute paths are directly hotlinked. 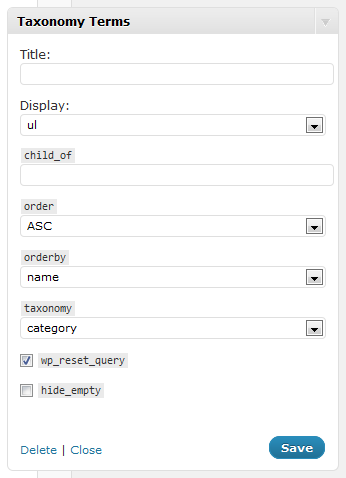 This plugin allows you to list the terms of any taxonomy in the form of a widget. Supports several options to select, order, and display the terms. Lets the admin to create a new blank plugin file, and start editing it right away.